Has there been a final word on whether or not there will be a achievement/trophy system implemented in the Switch? Not yet, hope there isn't. @marquard1959 No nothing yet. Unless it is tied somehow to MyNintendo, I am not expecting there to be any achievements. Lol well I really hope so. Even if it's something like the little tasks that come with their mobile games. I'd love optional achievements. If there's a way to disable them, then I can't see how anyone else would be able to complain about that. I don't know about other platforms, but I consider a game complete when I hit the credits, not because I got all the achievements. (Note: not my steam profile). 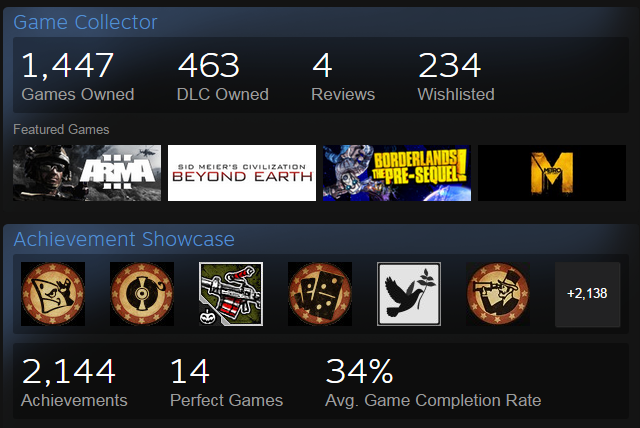 I should be able to list those games as complete whether I have the achievements or not. @shaneoh I never pay any attention to my trophies on my PS4, so I have no idea how they handle it. Still, considering the fact that I'm able to play games without getting interrupted by them means that they're not mandatory. I don't care about them and they don't take away from my enjoyment at all. There are so many games that don't consider themselves completed when you hit the credits, regardless of whether you collect all the achievements or not. So I don't see the issue.. If you consider a game completed when you hit the credits, then that's fine, right? Just move on to the next game. I am happy to live without achievements/trophies, they do add an extra challenge in some titles but it isn't a necessity and can often become very frustrating to reach the 100/platinum, taking the fun away. Games that implement unlockable content for various tasks would be much more appealing, or linking to Miitomo in some way. I think the Switch should have achievements, even if it's just a little badge or something for completing a game, with other achievements possible to pursue if you want to. The badge for completion would be very visible when viewing someone's profile, but if you wanted to see anything more specific you'd have to dig a bit deeper. I've always thought Nintendo has the best options for achievements, too. Coins, mystery blocks, power-ups of various sorts, pieces of the triforce for Zelda games, different Pikmin, etc. : Nintendo has tons of usable "currency" and intellectual property where practically every game could have its own representation of achievements. @gamermole please don't use profanity, and censoring it doesn't work either. I don't mind achievements. I personally never pay any attention to them, though. I thought it would have been nice if they implemented achievements in the form of badges to decorate your user interface - like Nintendo Badge Arcade, without the laughable crane minigame. It could have been a natural improvement over Miiverse Stamps, which weren't bad. I used to hate achievements when they were first introduced, but I definitely mellowed with age - when done right, they are a nice way to push you to do things in the game you wouldn't have done otherwise. Granted, if you don't like a game, no achievement can make the experience longer or better, but if you like a game already, it's nice to complete little tasks for micro-rewards. I get Nintendo doesn't want to copy blatantly from their competition, so implementing achievements like Sony or Microsoft is out of question. But we already had some kind of trophy system in their games (Mario Kart, SM3DW, Smash Bros...even Tokyo Mirage Sessions), so by adding the badge concept (which is something that is theirs and nobody else is doing), they already have a recipe for something highly original. Bad site to bring up achievements.. this forum has historically been vehemently opposed to them. Like a gold trophy fell off a cabinet and killed their pa. Never seen people so angry against an optional feature as I have here in the past. The issue is that the system says that it isn't complete when I feel that it is complete. I like to play a game until I feel it is complete, but the obsessive side of me is irked that the system considers otherwise. I've always thought Nintendo has the best options for achievements, too. Never seen people so angry against an optional feature as I have here in the past. It's only optional when we can opt out. I don't mean hide the notifications, but choose not to participate at all. But that's not the case, they're automatically unlocked. when done right, they are a nice way to push you to do things in the game you wouldn't have done otherwise. See, if you enjoy the game you shouldn't need any sort of push. A person will play it again and again and the experience will change each time.